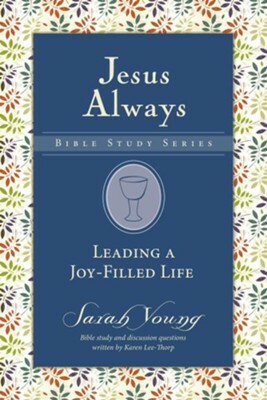 In this new study based on Sarah Young's book Jesus Always (SKU: 039509), readers will explore how to experience God's joy in their lives and express their gratitude to Him for His blessings. Each eight-session study includes readings from the book, selected Scripture, study questions, and daily reflection questions. Designed for use in personal, small group, or classroom settings. 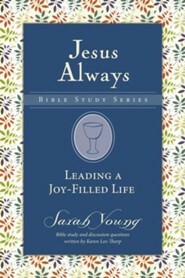 In this eight-session Bible study, Leading a Joy-Filled Life, explore what the Bible has to say about expressing gratitude to God in all situations, finding joy even in the mundane aspects of life, and adopting a mindset focused on the eternal blessings that God has promised for those who serve Him. Discover, as Paul wrote, how to "be joyful in hope, patient in affliction, faithful in prayer" (Romans 12:12). Each Jesus Always Bible study includes readings from Jesus Always, selected Scripture and study questions, daily reflection questions, and is designed for use in personal small group, or classroom settings. I'm the author/artist and I want to review Leading a Joy-Filled Life, Jesus Always Bible Study Series, Volume 3.